Van Wert head coach Keith Recker (left) and Cougar quarterback Nate Place (right) were recognized as the coach and player of the year, respectively. Van Wert went 8-2 during the regular season and made its first appearance in the postseason since 2000. The Cougars also won their first playoff game. VAN WERT – It’s just a position on the football field for Van Wert senior Nate Place. As long as Place has the football in his hands, there’s a chance for a big play. More often than not, the dual-threat quarterback does it with his feet. Place did it so well this fall, that he was named to the Division IV All-Northwest District team as a running back, instead of quarterback. With Place’s stellar performance this fall, he also was named The Lima News Dream Team Offensive Player of the Year. During the regular season, Place rushed for 1,319 yards (first in the Western Buckeye League) and 21 touchdowns (first). Place also passed for 1,361 yards (third) and 11 TDs. He was first in the WBL in scoring (23 TDs and 140 points) and third in the league in total offense. Place was named the WBL Offensive Back of the Year. This season, Van Wert made it to the playoffs for the first time since 2000. The Cougars (9-3) made it to the second round (Division IV) before being eliminated by WBL-foe St. Marys. Van Wert was third in the WBL with a 7-2 league mark. In fact, the three losses the Cougars suffered this season were against the two WBL co-champions, St. Marys (twice) and Wapakoneta. Place (6-foot-2, 185 pounds) led the high-powered Van Wert offense that finished second in the league in total offense (413.5 yards per game) and second in scoring offense (35.1 points per game) this season. Place started his high school career as a wide receiver. However, due to injuries, he was eventually moved to the backfield. Blackmore will be playing baseball at Miami (OH) University next school year. Place wants to have the football in his hands as much as possible. “Playing receiver, you touch the football four or five times per game,” Place said. “At quarterback, you get a lot more (touches). I like having the ball in my hands a lot. So, I really enjoy playing quarterback. With Van Wert’s offensive scheme, Place was given the freedom to make last-second decisions at the line. Opposing teams had to respect both his passing ability and running prowess. 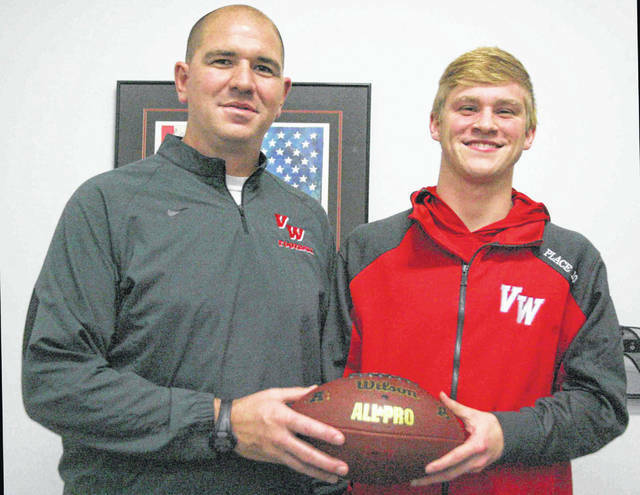 Van Wert head coach Keith Recker said Place blossomed into a top-level quarterback in a relatively short period of time. “It was neat to see how he transitioned from year to year,” Recker said. “At first, he was just a very athletic quarterback. Then he turned into an athletic quarterback that knows where the ball is supposed to go. Then this year, he turned into an athletic quarterback that really knows the offense. Place also plays basketball during the winter. In 2017, Van Wert’s football team finished 5-5 overall and 4-5 in the WBL. In 2016, the Cougars were winless. https://www.limaohio.com/wp-content/uploads/sites/54/2018/11/web1_Dreaam.jpgVan Wert head coach Keith Recker (left) and Cougar quarterback Nate Place (right) were recognized as the coach and player of the year, respectively. Van Wert went 8-2 during the regular season and made its first appearance in the postseason since 2000. The Cougars also won their first playoff game.